The species is widespread in Britain south of a line between the Humber and Glamorgan, but very rare further north and absent from Scotland. It is widespread in western and central Europe as far north as Denmark. 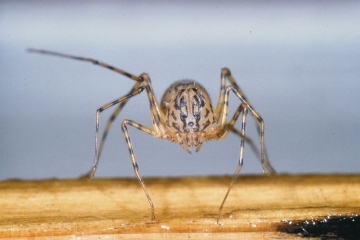 This slow moving species acquired the common name of spitting spider from its method of capturing prey. A sticky substance is squirted from the chelicerae in an oscillating movement onto the prey from a distance of as much as 10 mm or more, sticking it to the surface before it is despatched with a bite on the leg and removed from the gum before consumption. The squirting of gum is also used as a defensive measure against other spiders. Scytodes thoracica is limited within Britain to houses and other heated buildings where it may take as long as two or three years for the female to reach maturity. Adults can probably be found throughout the year though our very limited phenology data suggest a peak in July.